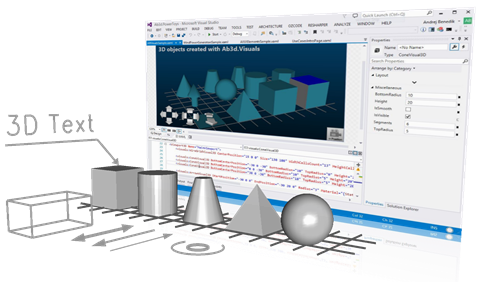 Ab3d.PowerToys is a .Net library that provides software components that are needed to easily add 3D content to any WPF or WinForms application. 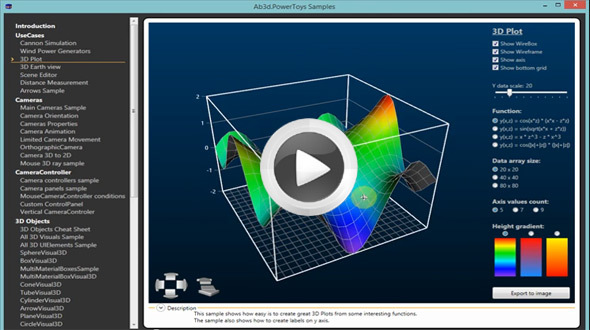 The Ab3d.PowerToys can be used to create custom 3D CAD applications, engineering tools, monitoring and simulations with 3D environment. 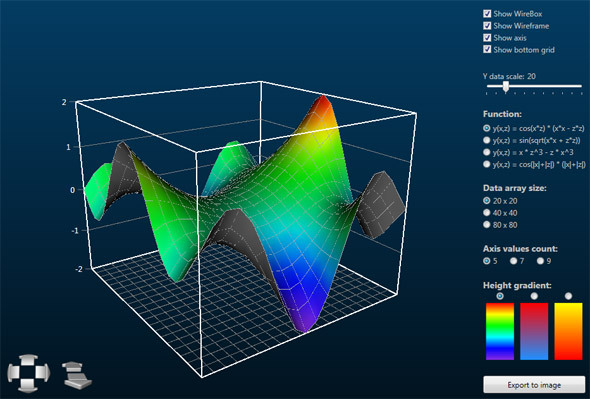 The library also comes with many samples that can be used as code snippets in your application. 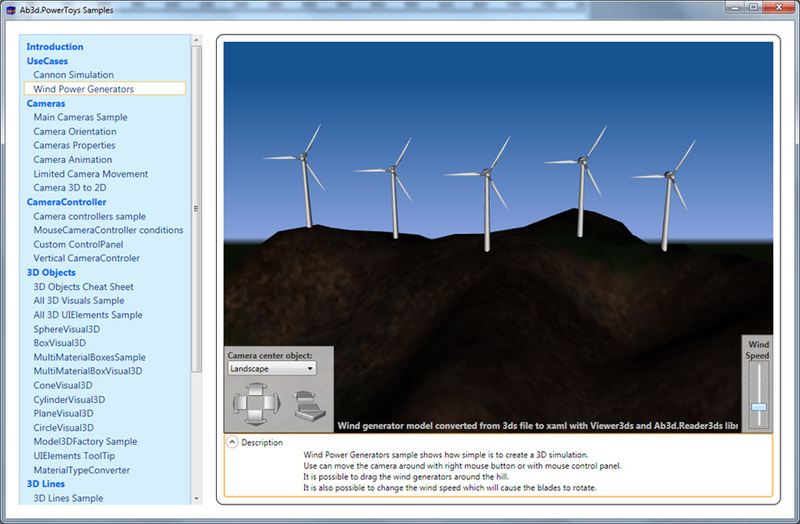 The Ab3d.PowerToys is using WPF 3D rendering engine that is based on DirectX 9. This provides decent hardware acceleration and can render many 3D scenes. But when the 3D scene is more complex, then it is possible to use a super fast DirectX 11 rendering engine - Ab3d.DXEngine. 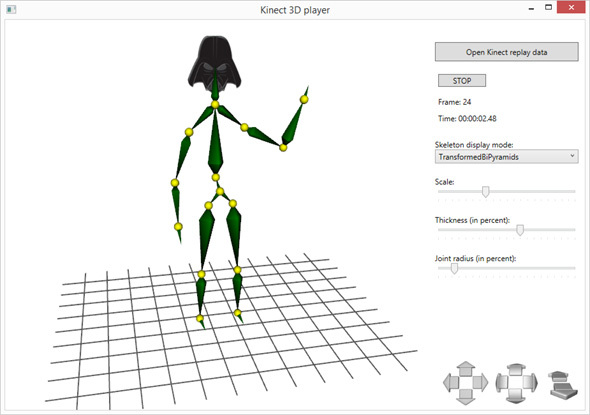 What is more, an existing application that is using Ab3d.PowerToys library can be upgraded to the Ab3d.DXEngine with DirectX 11 rendering engine in a few minutes (some additional time may be needed to use advanced features like object instancing to fully utilize the graphics card). 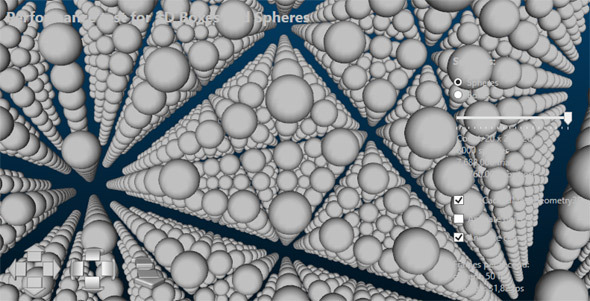 .3d, .3ds, .3mf, .ac, .ac3d, .acc, .amf, .ase, .ask, .assbin, .b3d, .blend, .bvh, .cob, .csm, .dae, .dxf, .enff, .fbx, .glb, .gltf, .hmp, .ifc, .ifczip, .irr, .irrmesh, .lwo, .lws, .lxo, .md2, .md3, .md5anim, .md5camera, .md5mesh, .mdc, .mdl, .mesh, .mesh.xml, .mot, .ms3d, .ndo, .nff, .obj, .off, .ogex, .pk3, .ply, .pmx, .prj, .q3o, .q3s, .raw, .scn, .sib, .smd, .stl, .stp, .ter, .uc, .vta, .x, .x3d, .x3db, .xgl, .xml, .zgl. 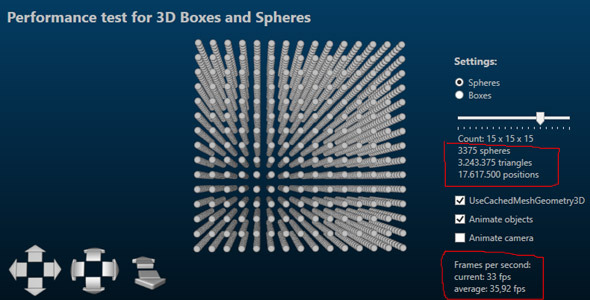 Showing 3D content was never easier! 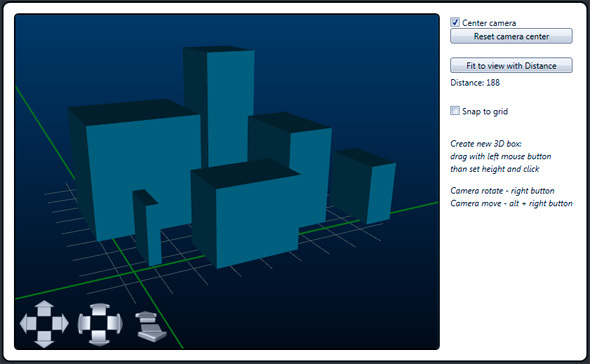 The library defines a few new Cameras that can be used instead of the current WPF's cameras. 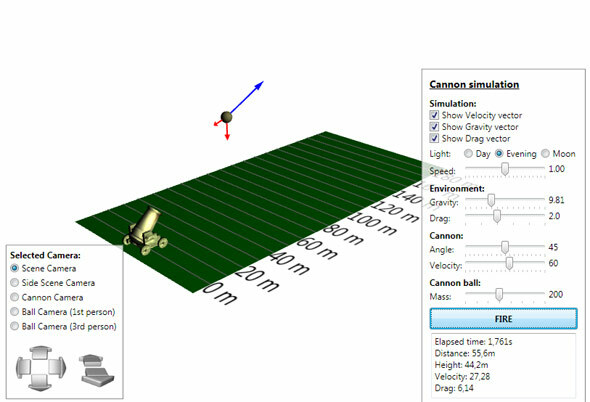 The main difference between Ab3d Cameras and WPF cameras is that Ab3d Cameras does not use Vectors to define the LookDirection, but instead use angles in degrees to define it. This is much more natural. For example if you want to look at the scene a little bit from the right and from above, you just define the Heading to be 30 and Attitude to be -45. You can also define the Distance from the scene. 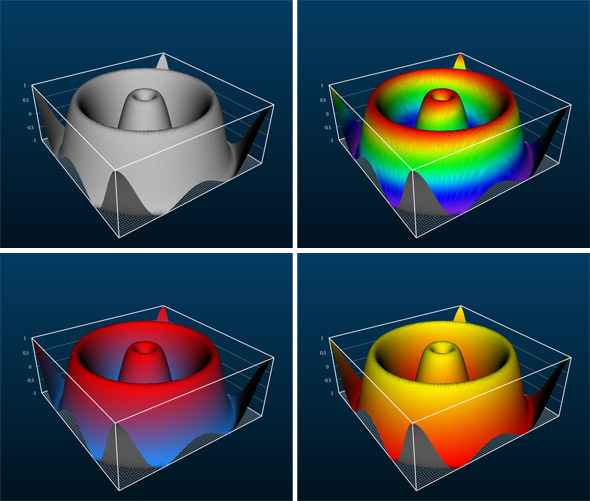 The most important Ab3d Cameras are: SceneCamera, FirstPersonCamera and ThirdPersonCamera. A good overview of the new cameras can be seen in the Cameras cheat sheet document that can be opened from a link below. The CameraControlPanel shows nice buttons to rotate and move the camera and also move the camera closer or farther away. 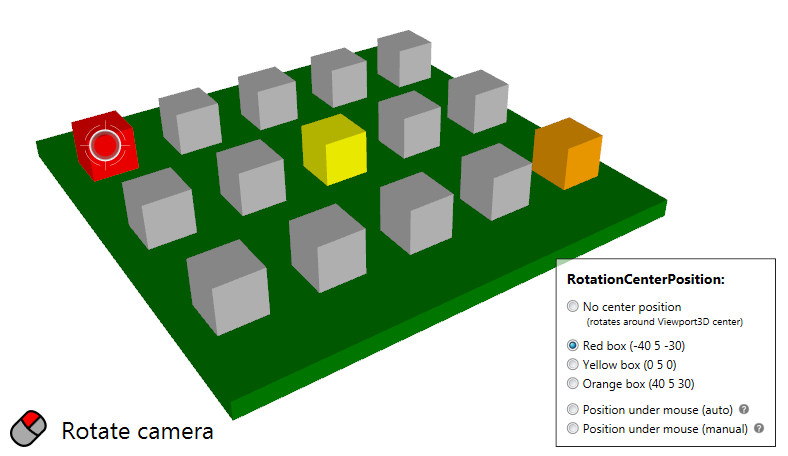 There are also a CameraPreviewPanel and CameraAxisPanel that graphically show the current orientation of the camera. 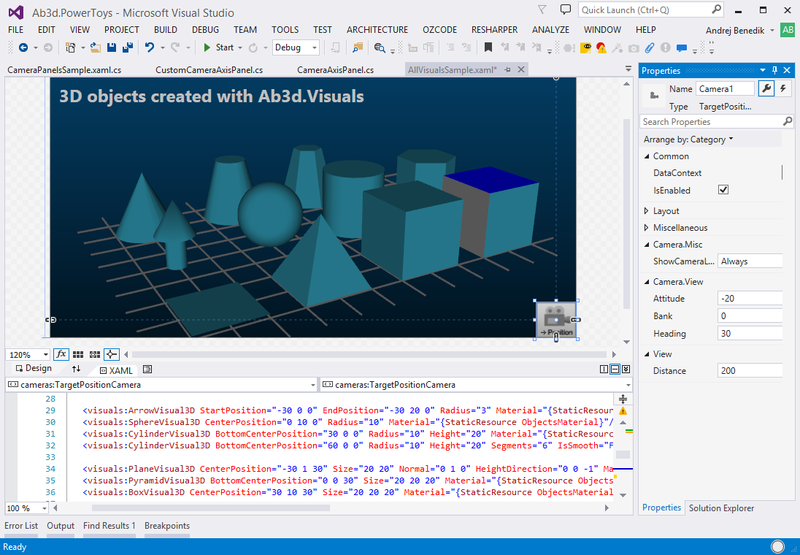 The Ab3d.PowerToys library also contains classes to create basic 3D models in code or XAML. 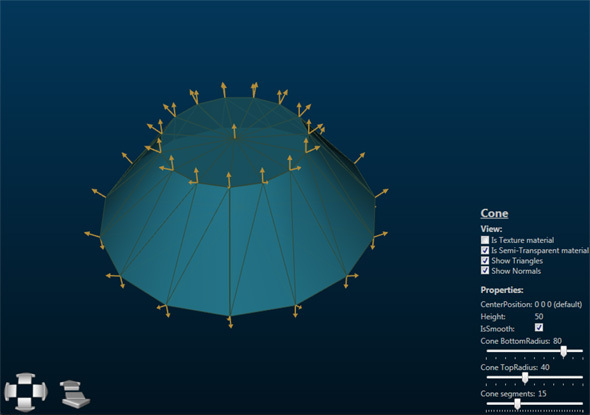 It is possible to create Plane, Circle, Box, Arrow, Pyramid, Sphere, Cone and Cylinder 3D models. 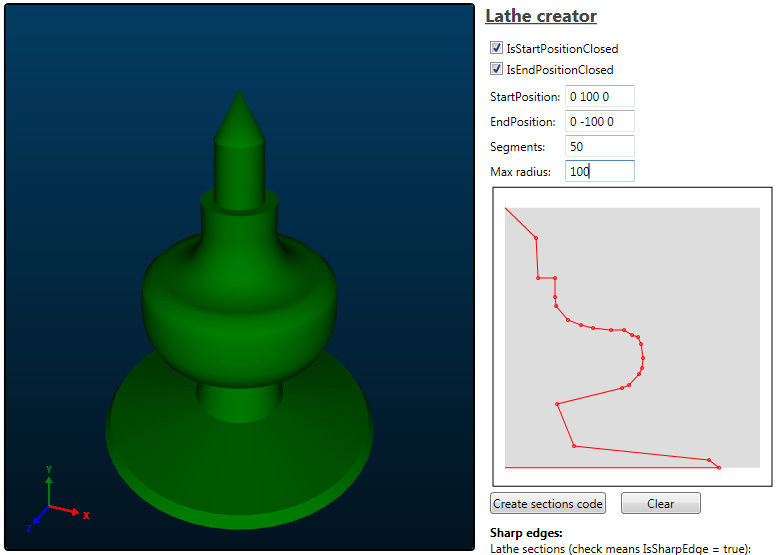 The library also supports creating objects by extruding a shape or by converting a shape to 3D object with lathe algorithm. 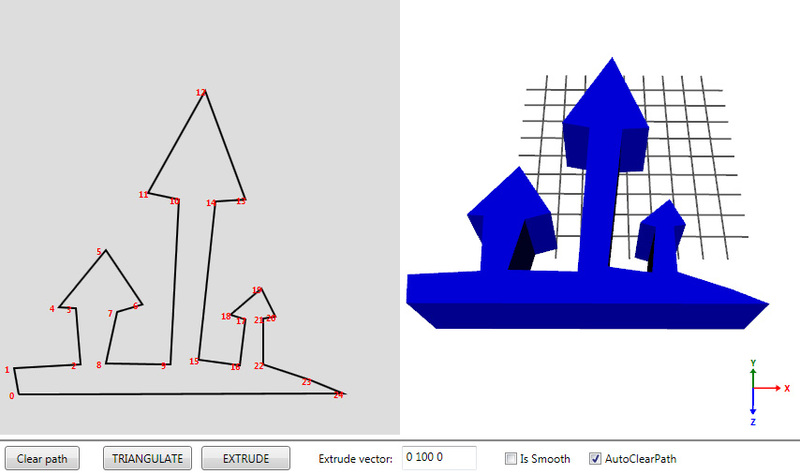 To make the 3D objects definitions cleaner a ModelTypeConverter is used for all Material properties used by 3D objects. This way it is possible to set the material with a color name or code (#FFFFAAAA) or image uri. 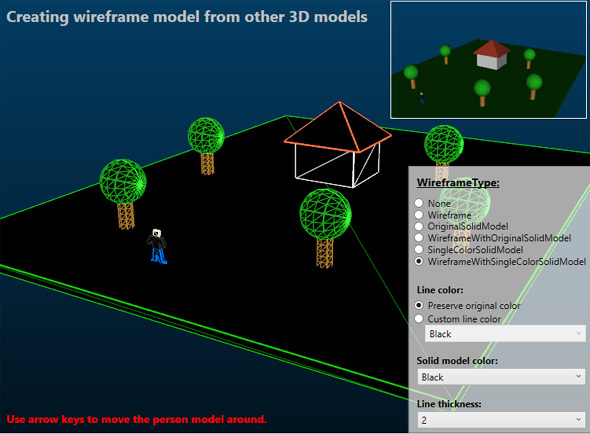 The library support 3D Lines with optimized update mechanism that makes the 3D lines implementation the most advanced and with the best performance for WPF. 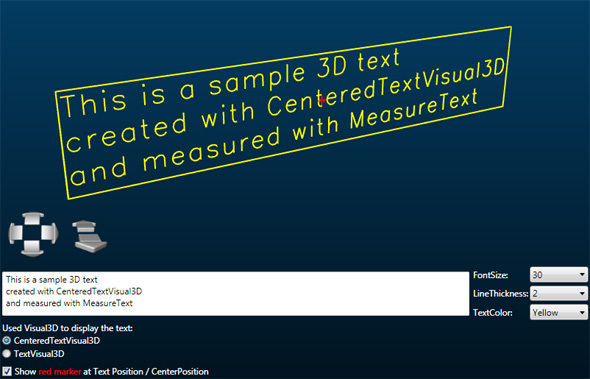 The library also supports 3D Text that can be defined anywhere in 3D space. 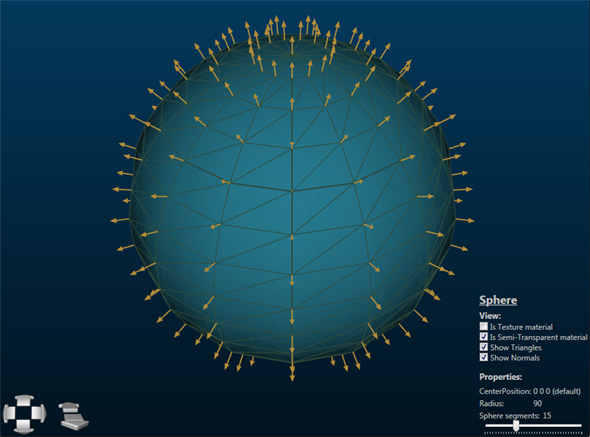 The text is drawn as a series of connected 3D lines that are created from internal font definition. 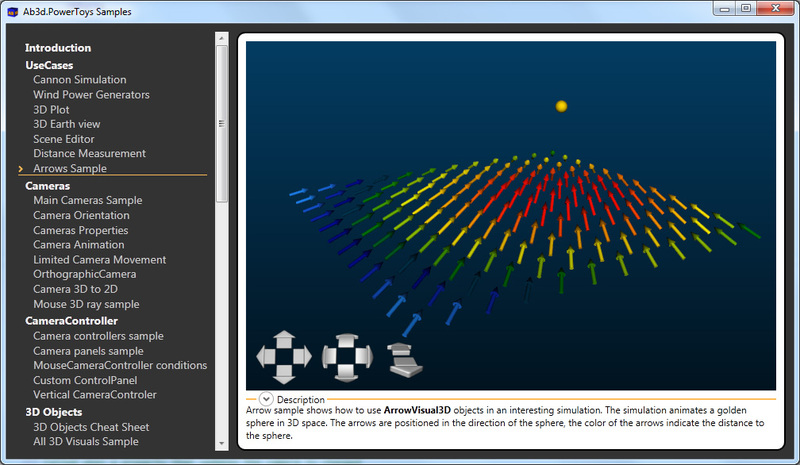 The EventManager3D class is a helper class that enables user to simply subscribe to mouse events on 3D objects. The following mouse events are supported: MouseEnter, MouseLeave, MouseMove, MouseDown, MouseUp, MouseClick, BeginMouseDrag, MouseDrag, EndMouseDrag and MouseDoubleClick. 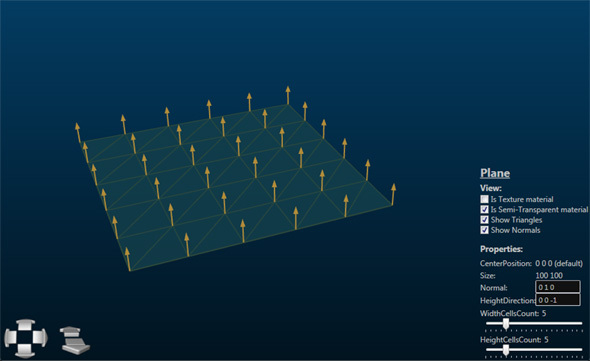 This way you do not need to do the complicated 3D hit testing any more. 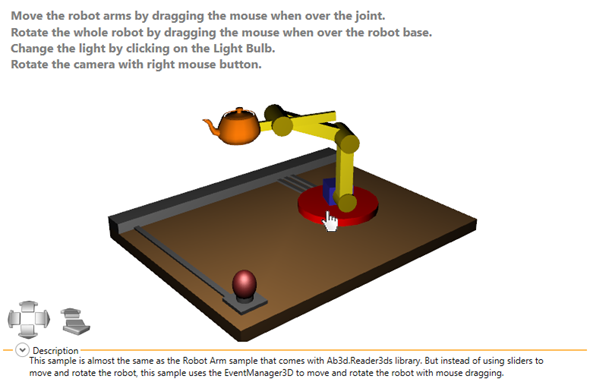 The EventManager3D is also better than WPF's ModelUIElement3D because it supports more mouse events (including mouse drag in 3D), provides better event data and preserves the structure of the 3D models. This way your code is much simpler and better organized. 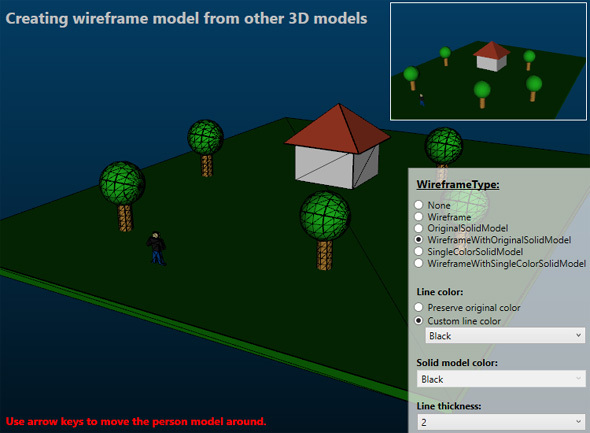 WPF 3D can show transparent 3D objects. 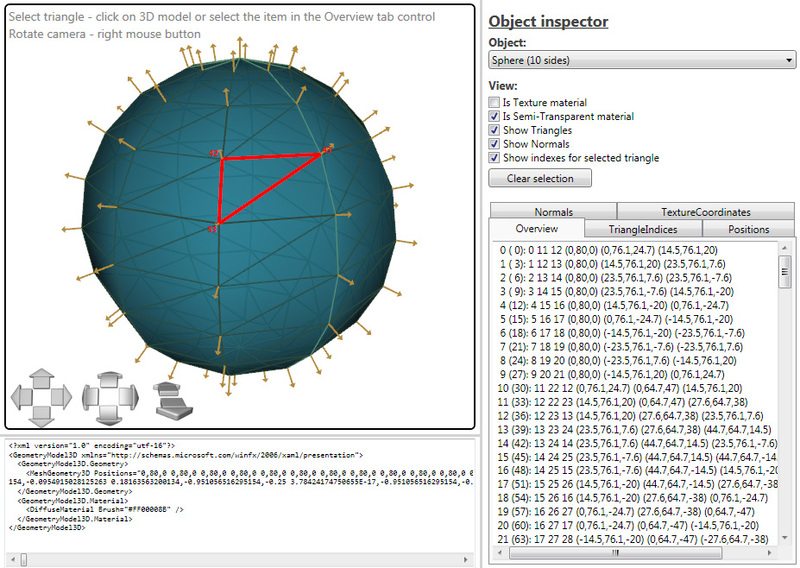 But to show them correctly, the transparent objects need to be correctly sorted. Without this some of the objects are not visible through the transparent objects. Ab3d.PowerToys provide complete solution to this problem. More about that can be read in Transparency Sorting page. 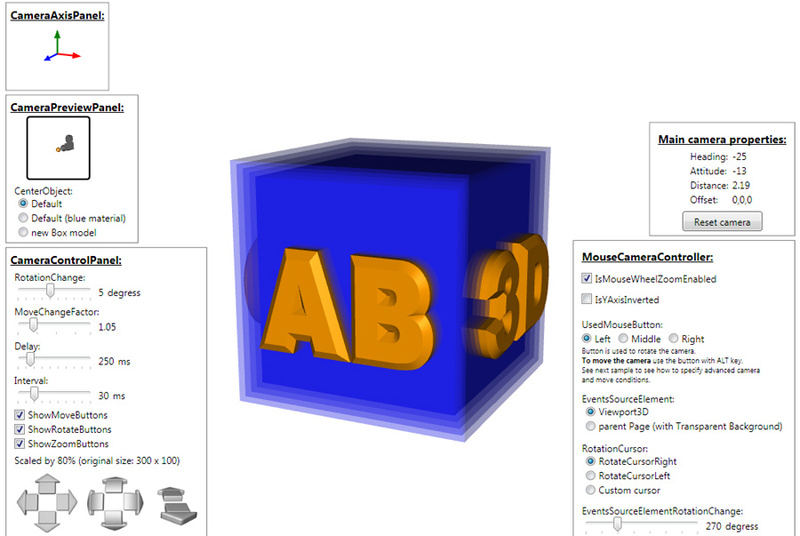 Ab3d.PowerToys includes a Ab3d.ReaderObj class that can be used to read 3D models from obj files. 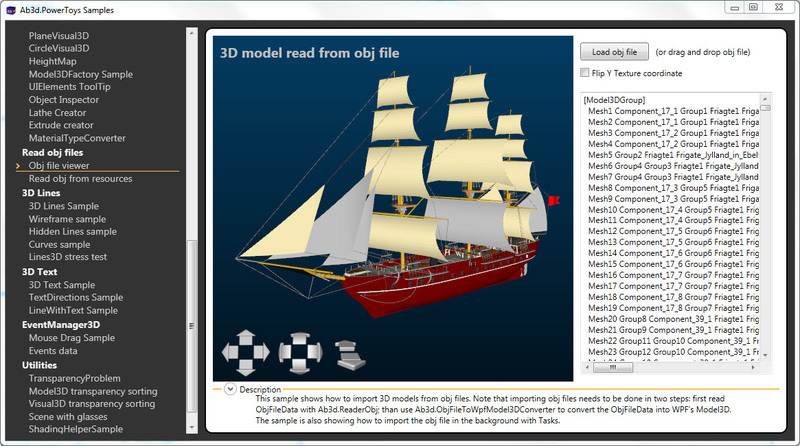 Obj file is very common file format to store 3D models. It usually comes with mtl file that defines the materials used in obj file. Because data in obj and mtl files is written in plain text, parsing the values can be quite slow and can consume a lot of memory (creating many string instances). 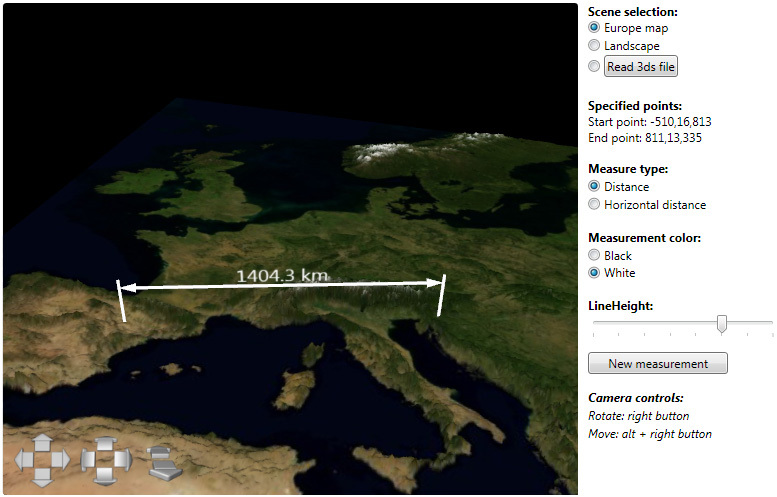 Therefore the ReaderObj has been greatly optimized to read obj files very fast and with very low memory usage. 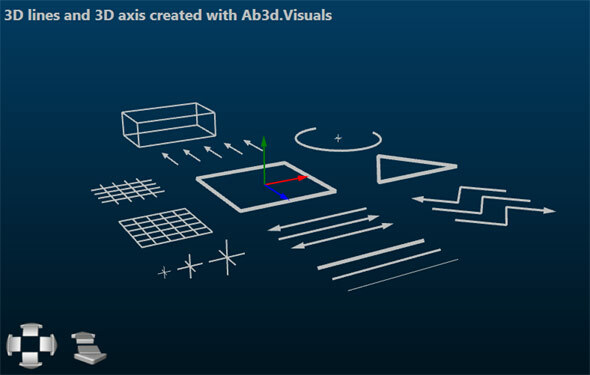 To get some additional information about using Ab3d.PowerToys and see how easy is to create great business applications with 3D graphics see the following blog post. 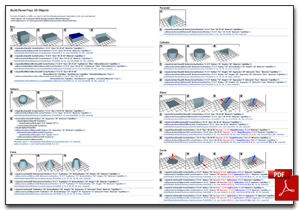 See also an overview of our 3D products.